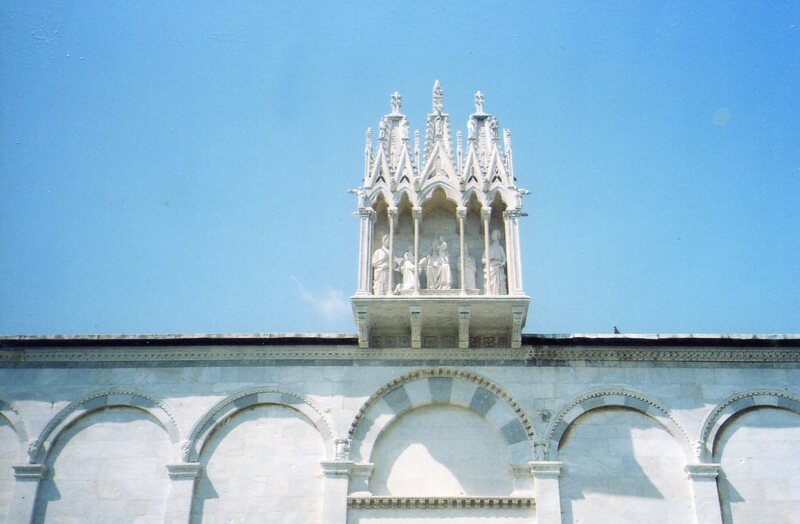 A lot of the folks who ogle over Pisa’s Leaning Tower miss the Campo Santo. Too bad for them–it’s one of the stateliest buildings I’ve ever seen. But wonderful for me because I practically had it to myself. Come in and explore it. 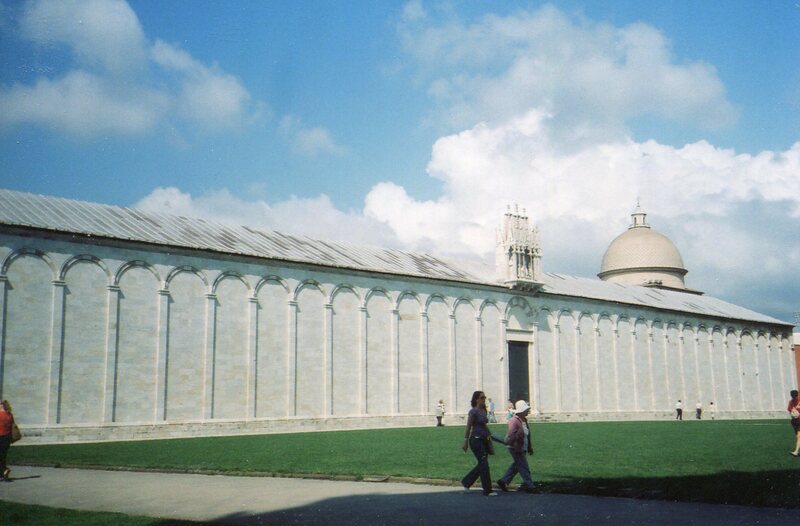 The Campo Santo was built next to Pisa’s cathedral, so it’s part of the Field of Miracles. Campo Santo means Holy Field. Pisans shipped soil from Mt. Golgatha in Jerusalem and made this area their burial ground. Alick McLean, in The Art of the Italian Renaissance wrote that Pisans might have done this because they had conflicts with the Papacy. Pisans often supported the Holy Roman Emperor in his dog fights with the Church, and they sometimes didn’t join the crusades. This commercial city was aware of its growing stature in Europe, and it was pursuing its own course. 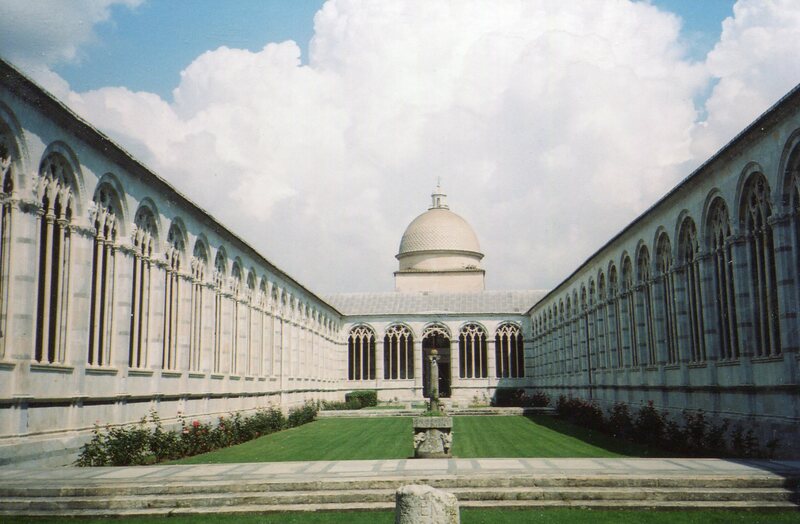 The folks of Pisa might have created a transplanted Jerusalem to ensure their well-being in the afterlife. At first, Pisans built replicas Jerusalem’s buildings around the field, but in the 13th and 14th century they constructed this building, which made their heavenly field into their own artistic expression, and a fantastic example of Western Culture. 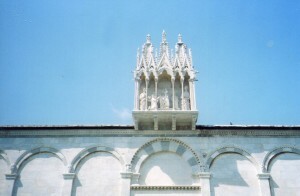 Above is a shot of the exterior, which I took from the area between the cathedral and the baptistery. So this is the most common view that Pisans would have seen of it. 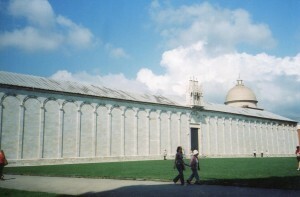 This building and the baptistery bracketed the life cycle. By being next to the cathedral, both put each person’s life under the care of Christ and Mary. And so Mother and Child hover over the entrance within graceful late Gothic arches. Pisans used ancient Western ideas to express their view of a spiritualized afterlife. The elegant row of Romanesque columns and arches on the exterior expresses Western assumptions that static geometric forms are eternal truth. So do the Gothic arcades on the inside. The forms are now more ornate, as though the soul has crossed the threshold between the world and heaven. 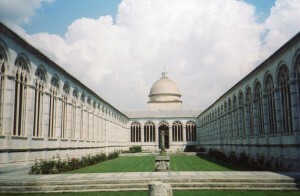 Christ and his Mother preside over this entrance under the most graceful arches of all. The white color of all these lines of columns and arches makes them seem pure. Waking through the inner yard made me feel serene. The walls inside the Gothic arches were covered in frescos from around 1300 to about 1500, and many are still preserved. Above, Christ looks over a medieval depiction of the cosmos, which is a series of circles reminiscent of the baptisteries in Parma and Padua, and Dante’s Divine Comedy. The 12 zodiacal signs are in the middle. People then thought that God created a fixed order of things, with everything in its place. 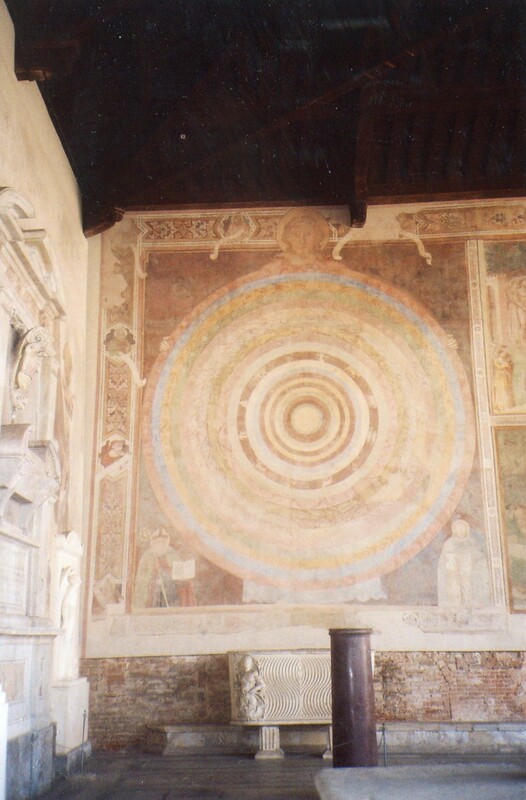 The Campo Santo’s 3 systems of arches and this fresco express assumptions that static geometric forms are basic, and that nature is ordered around them. The increasing elegance of the 3 systems and the figures of Christ and Mary spiritualize this geometry. If the Pisans were giving the Pope an “In your face!” they did it with supreme beauty. Ever independent, they created their own heaven which still entrances.